The Taste of Chicago is a happening place this time of year and one of the new vendors for 2009 is Garrett's Popcorn. Garrett's Popcorn is a favorite treat of Chicagoans it's some amazing popcorn. Locals especially love the "Garrett Mix" which is a combination of their famous CheeseCorn and CaramelCrisp popcorn. Oprah even listed Garrett's popcorn as one of her "Favorite Things" in 2002. 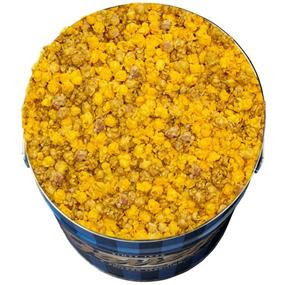 In honor of this local snack we love, especially during the summer, a lucky reader will receive a 1 gallon tin to enjoy! The Garrett Mix is the culmination of our popcorn tradition! Our chefs gently blend CaramelCrisp® and CheeseCorn™ together to create The Garrett Mix. Take comfort in The Mix’s seductive sweetness and wholesome, savory cheesiness. - Do you have a favorite popcorn flavor or a specific way you like your popcorn? Deadline: Thursday, July 2nd, 2009 at 12 midnight CST. ONE WINNER will be randomly chosen by Random.Org's Interger Generator based on the number of your comment and will be announced on Friday, July 3rd, 2009. Good luck! YUM! I love popcorn! My favorite is actually the mix you listed. I normally get some of each and mix them myself. I love cheddar popcorn! Smart Pop is my fave and I eat it like candy! Ha! Popcorn is one of my favorite things! My favorite way to eat popcorn though is when my Mom and I get together every Halloween and make Carmel Popcorn Balls (with M&M's)! They are gooey and delicious! I lvoe Garrets popcorn with the carmel and cashews!! So good!!! I love Garretts Mix! Yummy caramel and cheese popcorn mixed together for a flavor that is only Chicagos! I love popcorn with butter (I use the spray butter) and dry ranch dressing sprinkled over the top! Mmmm... count me in! I LOVE popcorn! I eat it almost every night! :) My mom and I normally add in Peanut M&Ms as a little extra treat! I love cheese popcorn! Or any of the flavored popcorns - more savory than sweet! I can't for the life of me remember the name of this popcirn but it's chocolate & white chocolate drizzled. It's sinfully good! I love Kettle Corn. Slightly sweet, slightly salt - and oh so good! I love popcorn with white chocolate. I normally don't eat too much popcorn, but I love caramel popcorn... and I've recently become addicted to kettle corn! I love movie theatre popcorn. With extra butter of course! Hubs and I love air popped popcorn tossed with some butter and salt. So simple, but so good! I am also a kettle corn fan, especially the kind from carnivals! (I'm probably not eligible to win, but I love popcorn). I prefer cheddar cheese and caramel mix just like Garrett's has. I love movie theater popcorn and cheddar flavored!! The Garrett Mix sounds awesome -- the same salt and sugar combo that I like when I mix popcorn and M&Ms... mmmmmm. I love caramel popcorn. The only way I like buttered popcorn is the jelly belly type. My dad makes the best oil popped popcorn ever! That's def my fav! Butter with a little Garlic Salt...Perfect for sitting down to a good movie. It really depends on my mood. I love kettle corn freshly popped. But I also love white cheddar popcorn or a mix of the 2. With lots and lots of butter!! Toss-up between Cheddar and good old fashion movie theater popcorn light on the butter. Now I'm craving it, thanks a lot, Joelen!!! mixed with chocolate chips, malt balls or chocolate-covered almonds...so good! I love it with cheese or carmel, not sure I would like them mixed, but I will give it a try. I love to make caramel corn. I put in tons of pecans that I add first to the caramel so they get coated, too. So delicious! my husband makes the best popcorn - fresh popped on the store with a good dash of salt right after it pops! I love Kettle Corn from our local fair in September and 4th of July festival. The bag is gone in no time. Kettle Corn, or homemade caramel popcorn! I love caramel corn, especially from Garrett's. I feel like I could eat the entire tub in one sitting. Kettle corn is my favorite, but I love any kind of salty/sweet popcorn combo, particularly if there is chocolate involved! I thought that I invented that (! ): mixing the cheese and the caramel in a bowl to snack on while watching a game or movie. The salt and the sweet is a great combination. Maybe I heard about Garrett's doing it on Oprah. I would love to taste the real thing. I adore movie popcorn with tons of butter! It's totally a heart attack waiting to happen, but I so don't care. My fave is Kettle Korn!! I am a huge fan of kettle corn. I also love some of the specialty popcorns with chocolate drizzle! Depends on the mood. However I love a white cheddar popcorn, a kettle corn, or buttered popcorn with chocolate drizzle. I LOVE cheese popcorn but also enjoy caramel corn with spiced pecans and M&M's tossed in! This would be a wonderful prize, especially since we missed Garrett's during our trip to Chicago in October!! We love caramel corn or cheddar cheese!! I LOVE popcorn drizzled with chocolate - either white or dark! The mix of salty and sweet is so good - just like the cheese and caramel flavors! The whole popcorn-drizzled-with-chocolate thing is addictive. I recently had Garrett's for the first time, and I could not believe how great it was. Garrett's has the BEST popcorn ever, i've only had it once and it was 2 years ago - but I still remember! It's a toss up between cheese popcorn and chocolate/caramel popcorn! i am a cheese popcorn girl all the way..any kind of cheese and plenty of it!! Everyone loves Popcorn, and Chicago loves Garrett's Popcorn. It's the BEST! I looooove caramel corn. My friend's mom used to make it when she'd come visit. SO GOOD! Love love love Garret Mix, especially when hot and fresh, mmmm!! Caramel and cheese mix has always been my favorite but I recently tried the pecan caramel and love that too!!! butter, parm cheese and black pepper. yum! my mouth is watering for some tasty cheese and caramel mix! I like the shiny red cinnamon popcorn. And if I am at the movie theater then it is milk duds and buttered popcorn! I love the mix of cheese and caramel. When it's hot on a slightly cool day, it's the best snack to take strolling on Chicago streets. my favorite is caramel corn! Popcornopolis! Their caramal corn is amazing! I've never had Garrett Popcorn but I would love to try it. My favorite popcorn is Moose Munch from Harry & David. I LOVE Garrett Popcorn!!! Caramel Crisp is my favorite and I love any kind of kettle corn. Popcorn is my go to food for dinner or snacks....love it.